The Japanese love their food. This can be seen by the number of people who eat out, even in a time of recession, and the number of food-related programs on TV. Tell someone that you're taking a trip to Hokkaido and the first thing they'll do is insist that you try the seafood while you're there or the Okonomiyaki in Osaka and so on. While sushi has become increasingly popular in the West, most Japanese food remains pretty much unknown. Japanese restaurants around the world have tended to cater for Japanese tourists and have been priced accordingly, ie. expensive. But in Japan there is a huge variety of food available at prices ranging from a month's salary to very reasonable. These two dishes are often thought to be one and the same. Sashimi consists of thin slices of raw fish or other seafood served with spicy Japanese horseradish (wasabi) and shoyu while sushi consists of the same, served on vinegared rice, but also includes cooked seafood, vegetables and egg. 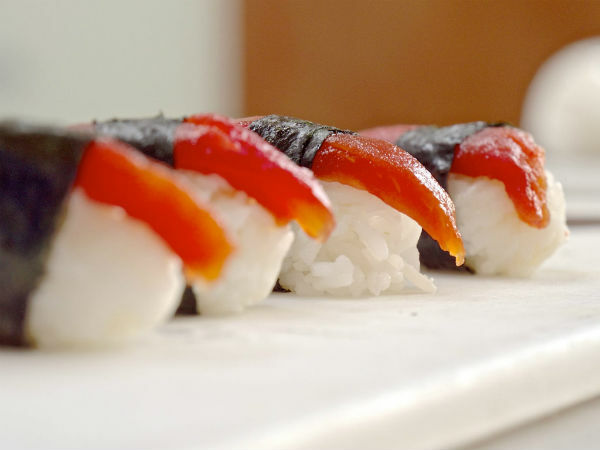 Another form of sushi is norimaki, or sushi roll, in which the filling is rolled in rice with a covering of nori. Sushi can be breathtakingly expensive, in exclusive, invitation-only restaurants where you eat whatever the chef selects for you. But it can also be cheap and cheerful fast food. 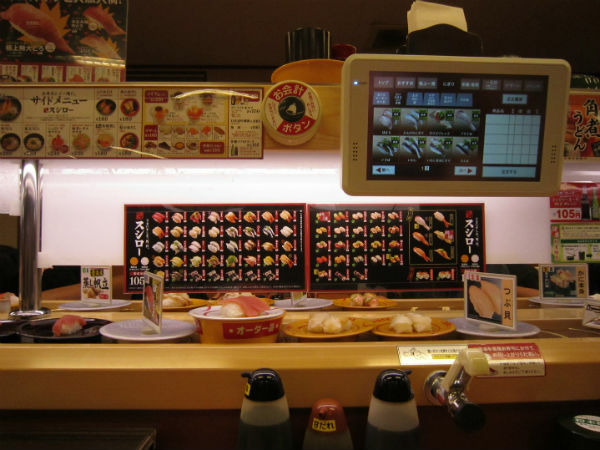 Cheap sushi is available at supermarkets or at kaiten-zushi restaurants, where customers sit at a counter and choose what they want from an ever-changing conveyor belt. These are usually highly automated and ensure that no dish goes around more than a couple of times. 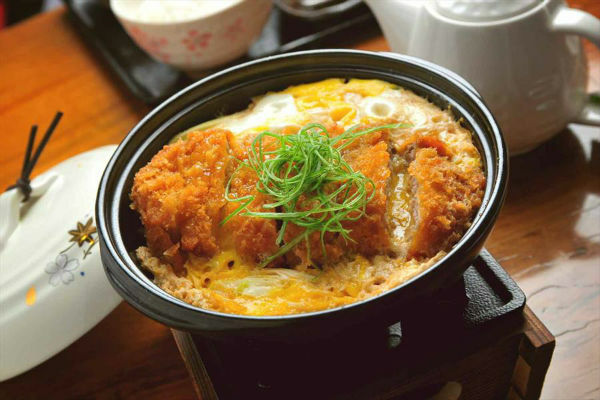 These dishes consist of a bowl (domburi) of rice covered with one of a variety of toppings such as boiled beef (gyudon), chicken and egg (oyakodon), deep-fried shrimp (tendon) or deep-fried pork cutlet and egg (katsudon). They are often eaten as part of a reasonably priced 'lunch set', with miso soup and pickles. 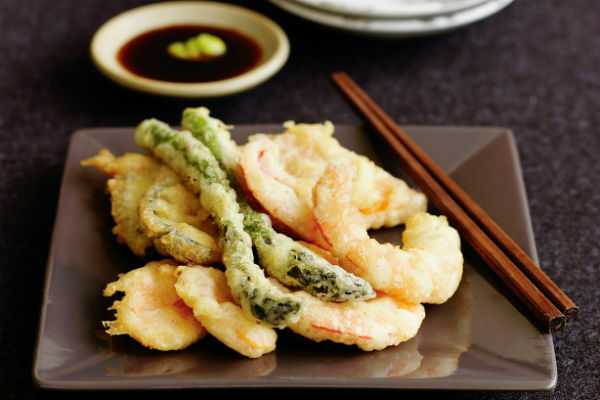 Seafood or vegetables dipped in batter and deep-fried, tempura is served with a dipping sauce and daikon. The word 'tempura' comes from the Portuguese 'tempero' (gravy or sauce) and this dish dates from the mid-16th century, when Portuguese and Spanish culture was first introduced to Japan. Tempura can be served with a side bowl of rice and soup or on a bowl of rice (tendon) or noodles (tempura udon, tempura soba). 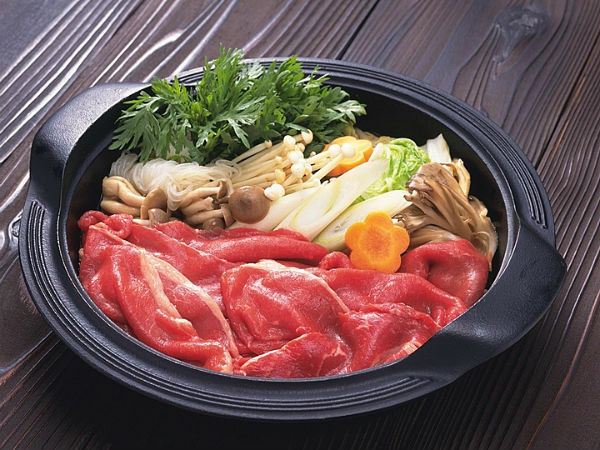 This is a savoury stew of vegetables and beef cooked in a large nabe and dipped in a bowl of beaten raw egg. The vegetables usually used are green onion, shiitake mushrooms and chrysanthemum leaves (shungiku). Also added are tofu and gelatinous noodles (shirataki) and the ingredients are cooked in a sauce made of soy sauce, sugar and sweet cooking sake (mirin). For this dish, diners dip paper-thin slices of beef in a pot of boiling water and stock for a few seconds and then dip the cooked beef in sesame sauce (goma dare) before eating. Later, vegetables such as enoki mushrooms and Chinese cabbage, tofu and shirataki are added. When cooked, these are dipped in a soy and citrus sauce (ponzu). After the beef and vegetables have been finished, udon can be added to the pot and eaten with the broth. Other flavorings used include crushed garlic, chives and daikon. Economical (for those with a big appetite) all-you-can-eat meals are common in Shabushabu restaurants. This can best be described as a savory Japanese pancake. Chopped vegetables and meat or seafood are mixed with batter and cooked on a griddle. 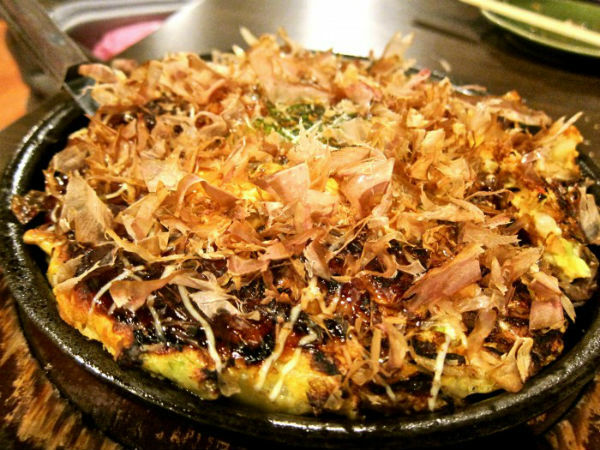 Like a pancake, the okonomiyaki is flipped over and cooked on both sides. It is then topped with a special sauce and mayonnaise and sprinkled with nori and dried fish flakes (katsuobushi). Variations include adding a fried egg or soba. Yakitori itself means broiled chicken. Various cuts of chicken, including heart, liver and cartilage are cooked on skewers over a charcoal grill. Also cooked this way at yakitori restaurants (yakitoriya) are an assortment of vegetables such as green peppers (piman), garlic cloves (ninniku) and onions (negi). They are flavored using either a tangy sauce (tare) or salt (shio). The menu will usually contain a variety of other foods as well. Yakitoriya are usually laid-back places where the food is a snack to accompany drinking. Japanese people started consuming a lot more meat after WWII and a drop in beef prices in the early 1990s led to yakiniku restaurants becoming ubiquitous across the country. The term translates literally as "grilled meat," and it consists of bite-size pieces of beef (and to a lesser extent pork, chicken, seafood and vegetables) that are grilled at the diner's table. Though overseas it is usually called "Japanese barbeque," in Japan it is often translated as "Korean barbeque."